Board certified in interventional cardiology, cardiology and internal medicine, Dr. Avendano completed both his internship and residency training in internal medicine at Baylor College of Medicine in Houston, Texas. He underwent fellowship training in interventional cardiology at Baylor College of Medicine, where he was chief cardiology fellow and outstanding fellow of the year. 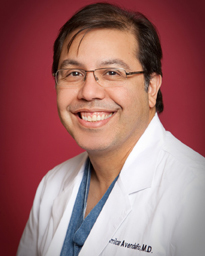 In 1994, Dr. Avendano began his practice in Houston. Fluent in Spanish, Dr. Avendano treats patients 18 years and older. His specialties include pacemaker placement, catheterization and peripheral angioplasty, coronary and peripheral stent and echocardiography. Dr. Avendano has been recognized by his colleagues and peers for his outstanding bedside manner and patient care. The father of two, he is an active volunteer in the Boy Scouts of America, enjoys playing chess and watching movies. Dr. Avendano practices at Memorial Hermann Medical Group Cardiology Cypress Station in North Houston. Dr. Amilcar Avendaño discusses the differences between a heart attack and a stroke. As you are aware, February is Heart month and Dr. Amilcar Avendano from Memorial Hermann Medical Group is here to explain the importance of taking care of your cardiovascular system and the difference between a heart attack and cardiac arrest.